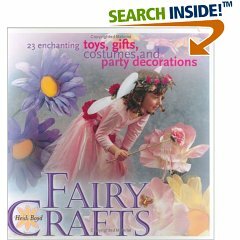 Here is a selection of items that you will need to make flower fairies: Silk flowers, paper covered wire, wooden beads, sequins, beads, embroidery thread or floss. You will also need a permanent marker, round nose pliers and some strong pva glue. Paper-covered wire can be bought from cook shops & florists. The paper has a tendency to unravel so you need to dip the ends into pva glue when you cut them. 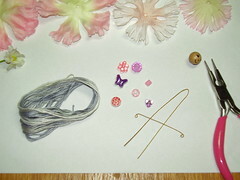 Cut the wire into two lengths – one piece into a 6½” length and one piece into 2½” length. I have used size 13mm wooden beads, which I varnished with some craft varnish/glaze. I used a permanent marker to draw on the fairy faces. 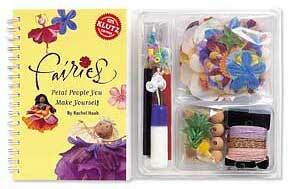 You could also use a colouring pencil to draw the faces on unvarnished beads. Using your round nose pliers, or a cable needle, curl under a small piece of each end of the short wire to make the hands. 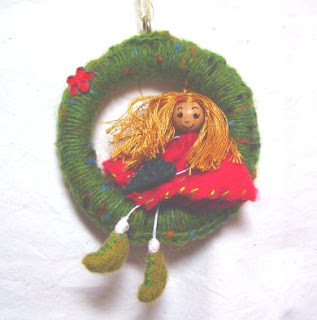 Take some embroidery thread and wind it around your fingers about 10 times to create the hair. 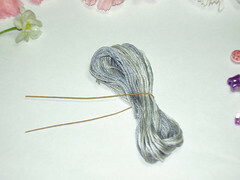 I have mixed grey, blue and light blue threads together to add texture. 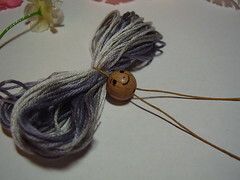 You can also use boucle, mohair and other fancy yarns instead of embroidery thread/floss. Bend the longer length of wire in half and catch the hair in the bend. Feed the wire through the hole in the wooden bead and push the bead right up to the hair. 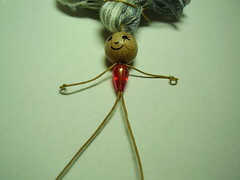 Pull the hair out of the way with a piece of scrap thread or wire. Attach the arms to the body by placing it horizontally below the head. Fold or twist the arms into place. 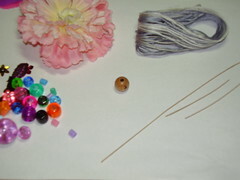 Feed on a decorative bead for the body. 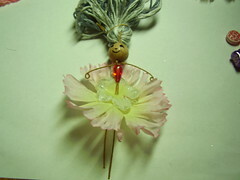 You can try out different beads: heart or teardrop shaped beads make pretty bodies. 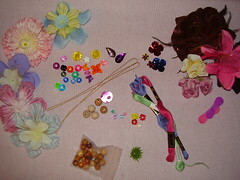 You can also add beads to the arms to make ‘puffy’ sleeves to match the bodice of the dress. Use your imagination. 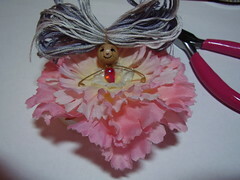 Add the silk flower petals, starting with the smallest: feed both legs through the hole in the flowers until you have added enough to make a pretty skirt. 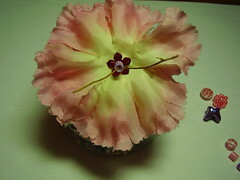 The more petals you add the fuller the skirt. 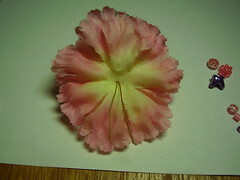 I have used carnation petals here. As you add each petal, you can also add a dab of glue between the layers to help keep them in place. This is a view of the underskirt with the legs peeping through. 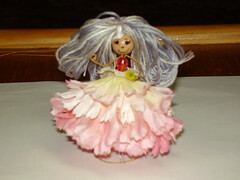 This is optional but it adds a nice finishing touch to the underskirt of the fairy. 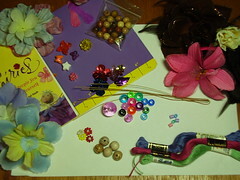 Push a sequin onto the legs, right up to the petal skirt and glue in place. Add a hama bead, feeding both legs through, and glue. Using the round nose pliers, curl under the bottom of the legs to make the feet. 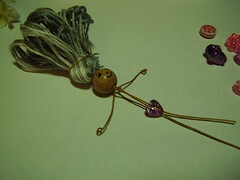 Or, you can add a teardrop bead for feet and bend the wire to secure in place. All that’s left is to style the hair and add props. 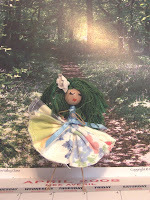 And here she is – the finished fairy! 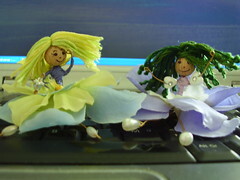 These two fairies have bodies made using embroidery thread. I took a length of thread and tied it to the body. Then, I wound it up the body, around the shoulders and back down. 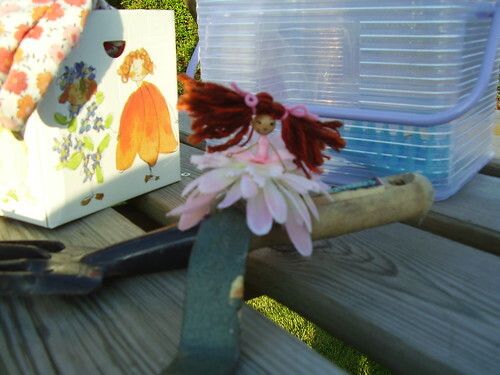 If you prefer, you can wind it along the arms (for sleeves) and then back down the body – as with the yellow fairy.